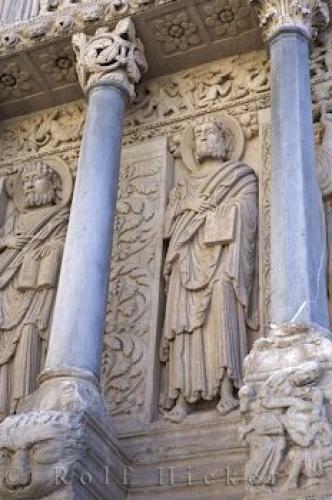 The ornate Eglise St Trophime pillars on the exterior of the church in the city of Arles, Provence in France, Europe. church in the city of Arles, France in Europe. ... Many tourists that visit Arles in Provence, France stop to admire the elegant artwork of the Eglise St Trophime in Place de la Republique in Arles, France.Eglise St Trophime in Place de la Republique, Old Town, Arles, Bouches du Rhone, Provence, France, Europe. I photographed this photo with the digital SLR camera model Canon EOS-1Ds Mark II, aperture of f/6.3, exposure time of 1/80 sec. on ISO 100, as always I used a original Canon Lens, the focus lenght for this picture was 70mm.